We’ve always been massively big on healthy food, and Blue Wilderness makes some of the very best available. One of THE most popular Blue Buffalo brands, we thought this line of kibbles deserved its very own set of reviews. Why? Because there’s just so much to love about meat-rich, gluten-free dog food.Of course, we’ll be looking at some puppy options, grain-free formulas, hypoallergenic recipes, and a nice Blue Wilderness Senior Food for those older dogs. With exciting flavors like ‘Beef and Chicken Grill’ and ‘Adult Alligator and Catfish’ to choose from, we’re almost tempted to try them out ourselves…but we’d probably better not! What’s Special About Blue Wilderness? Why the Blue Wilderness Puppy Food Reviews and Blue Wilderness Dog Food Reviews? Why is there rosemary oil in my dog’s food? Why am I seeing more and more ‘exotic’ ingredients in dog food? You can rest assured that Blue Wilderness products are all made by Blue Buffalo. At the time of writing this review, the Blue Wilderness line includes 82 products. All of which take their inspiration from our pet’s very close relatives — wolves! All products are therefore very much meat-based and rich in protein. But that’s not all; Blue Wilderness has varied and interesting flavors of treats, cans, and kibble for dogs of all shapes and sizes. 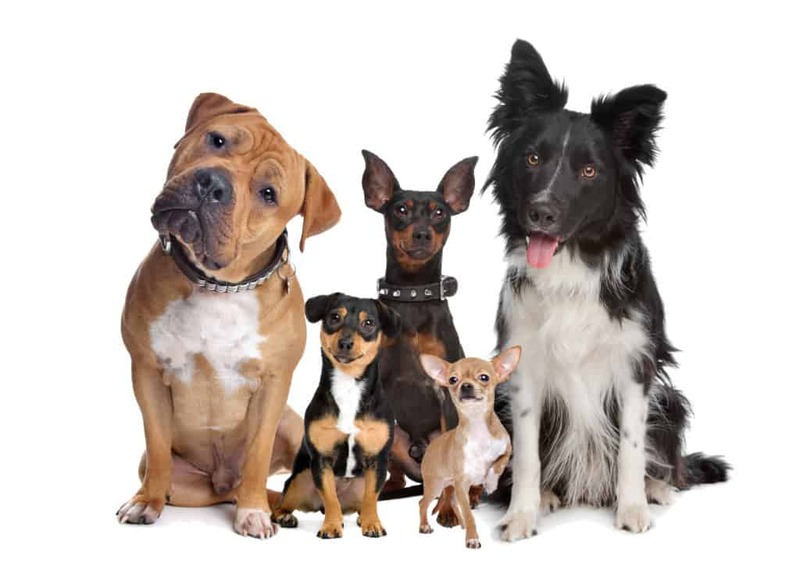 The company’s products are developed alongside in-house vets and professional nutritionists. So what about the Wilderness brand? What does it offer that’s different from your average supermarket pet food, and how does it compare with other Blue Buffalo products? 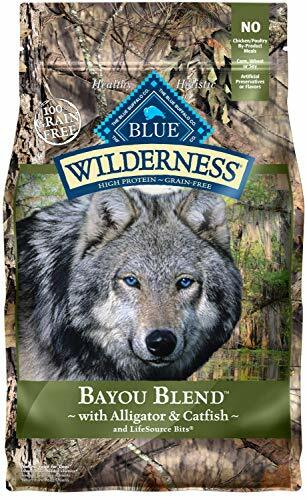 Blue Wilderness tends to offer higher levels of protein than other Blue Buffalo recipes. Wet and dry foods aren’t the only categories you’ll find in Blue Wilderness, either, the line has an extensive range of stew, loaf, and tray-style dinners that help you mix things up for your doggy best friend. 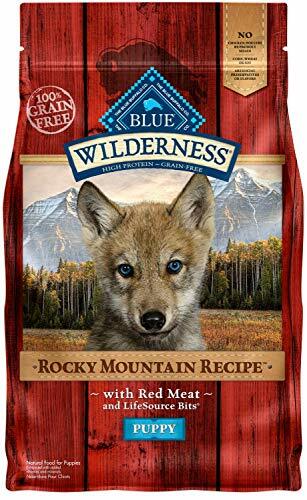 The most recent Blue Wilderness dog food recall (to date) occurred in 2017 when Blue Buffalo voluntarily recalled their Blue Wilderness Rocky Mountain Recipe Red Dinner. The concern related to the potential effects of specific hormones in one batch of cans. Some ‘Trail Trays’ from the Wilderness line were also recalled in the same year as they hadn’t been sealed properly. Two years earlier, some Wilderness bone chews were taken off the market because of suspected possible contamination with salmonella. This only concerned one particular lot size. As we’ve mentioned, all Blue Wilderness dog foods are made to be 100% grain- and gluten-free. With such ample choice, therefore, we’ve opted to review the most special-sounding kibbles! Yes, really! Alligator — you read that right. While it sounds unconventional, alligator is actually a really clever source of lean protein: it’s firm and low in fat, thanks to the active lifestyles of these predators. Bayou catfish for a novel dining experience. Now, how’s that for variety! While it’s certainly full of novel proteins, this recipe still contains chicken. As well as catfish and alligator, this includes shrimp — it’s like a pretty novel gumbo! Omega acids will aid in keeping your fluffy friend’s coat nice and healthy, while carrots and sweet potato provide fiber and beta-carotene. Yum! Large breed dogs are super, super popular across the States. But that doesn’t mean Chihuahuas, Shih Tzu, and other toy dogs don’t have appetizing recipes to choose from! Here’s a natural formula that’s specially developed for the needs of toy breed dogs. At 424 k/Cal per cup, it’s perfect for little dogs with quicker digestive systems. Not really, this blend even includes blueberries and carrots for vitamins! Naturally flavored, and with only vegetable juice for color, here’s a nutritious feast for our (very) little grown dogs. Plus, it includes Omega acids — pretty neat if you’ve got a long-haired toy dog. Certified nutrition for larger-breed pups, so our German Shepherds, Labs, Golden Retrievers, and Pitbulls won’t be getting too much calcium! Provides him with 35% protein! Unfortunately, pups who are allergic to potato won’t be able to eat this particular recipe. From this blend, our bigger pups will be getting L-Carnitine as well as brain-healthy DHA. It’s a nice addition given that some larger breeds tend to be quite muscly. Calcium levels are controlled at 1.2% to help avoid giving our pups an excess of this mineral. 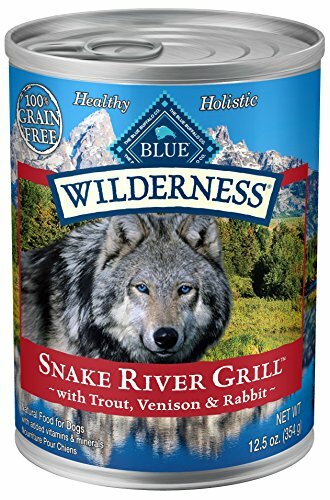 If good old red meat is more your puppy’s style, this Wilderness blend is designed to taste like a beef dinner! With high-quality beef, pea proteins, egg, and fish meal, your pup will be getting 32% protein in his dinner. It’s made with manageable bits — small kibble, in other words — to help puppy chew properly! Potato tends not to be an allergen for most dogs, but we’ve flagged it up here anyway, just in case! Otherwise, this is a great natural puppy formula with zero synthetic preservatives or flavors. It even includes venison for a little bit of a tasty change. 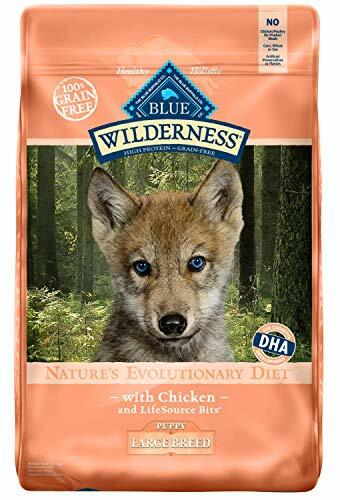 Blue Wilderness doesn’t technically offer hypoallergenic food as yet, you’ll need to look for a Blue Basics formula (or our giant Hypoallergenic Dog Food Review!) to find sensitive skin and sensitive stomach dog foods. 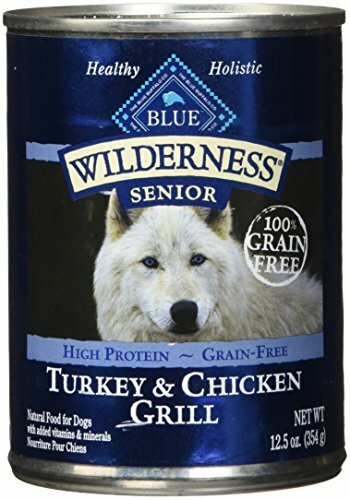 What they do offer, however, is some pretty awesome Wilderness Blue Buffalo High Protein Dry Adult Dog Food. This can easily be mixed with some warm water to fully unlock those tasty flavors. At 34% protein, it’s great for energetic and active grown dogs! Includes non-meat proteins like egg and peas. After careful review, all our Blue Wilderness Dog Food reviews have received our five-star rating so far. And this high-protein, delicious-sounding recipe is no exception. Perfect for active and moderately active grown-ups…dogs, that is! 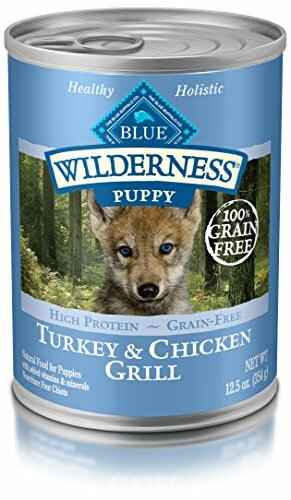 Most wet foods come in at around the 9% protein mark, but Blue Wilderness offers 10.5% protein for our growing pups. And that’s a nice healthy figure for puppies of all sizes to start building some lean muscle! The tantalizing flavor comes from delicious chicken broth. If we’re really going to nit-pick at this otherwise delicious, wholesome blend, there are no leafy vegetables in here. But otherwise, it’s pretty awesome! Pea protein and turkey make this sound like Thanksgiving in a can! But on the practical side of things, it offers a healthy mix of vitamins, minerals. And it’s protein-rich, all naturally preserved, and contains no questionable by-products. That ticks all our boxes — five stars. Don’t worry — there’s no snake meat in this delicious dog food. What this venison, rabbit, and trout recipe does offer, however, is a complete and healthy mix of proteins, fat, and nutrients for grown dogs and pups. Supplemented with all those essential vitamins, including B vitamins for Bounce! None to be found here! Blue Wilderness does actually make it’s separate ‘toppers’ for jazzing up your dog’s kibble, but we reckon this does the job excellently. Just stir a little and add it to your pet’s kibble and he’ll be able to enjoy a nice, savory, and complete mix of textures. Our older dogs need us to pay extra care to what’s in their foods. Not only will they often require glucosamine-containing ingredients to maintain joint flexibility, but they sometimes might a softer option than regular kibble. At 437 k/Cal per can, it gives your older dog enough energy to stay active and healthy. Senior dogs may not be as active as their younger counterparts, but they still require protein in their diets — it’s essential for their muscle maintenance. This is relatively low in fat, too, which is good if your dog is no getting as much exercise as he used to. We’re probably used to seeing rosemary in sprig form, on our roast chicken or turkeys. In dog food, rosemary actually plays a role as a natural preserving agent. The herb is sometimes used in extract form rather than oil form, and often replaces synthetic agents such as BHA. It contains free radical-fighting antioxidants, and AAFCO-approved dog food will usually have only a small amount of it. Some dogs have been known to react badly to rosemary, so always consult your vet if you have concerns about your pet’s health. 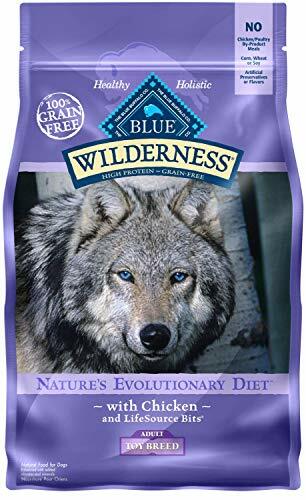 As you’ll see in our Blue Wilderness dog food reviews, ingredients like alligator and bison are starting to become slightly more common. Undeniably, there is competition between manufacturers, with unique offerings being one way to stand out. However, there are some dietary reasons behind why owners might choose to buy dog food with novel or ‘exciting’ ingredients. One main reason is that mixing up protein ingredients can help to reduce your dog’s risk of overexposure to any one meat or animal. Our pets tend not to get as much variety as we do, and over the long-term, some can develop intolerances to very common meats — chicken and beef are two examples. So-called ‘exotic’ foods are simply one way to reduce the risk of overexposure to certain foods. However, we always advise that you go straight to get a vet’s advice if you suspect allergies may be a concern.